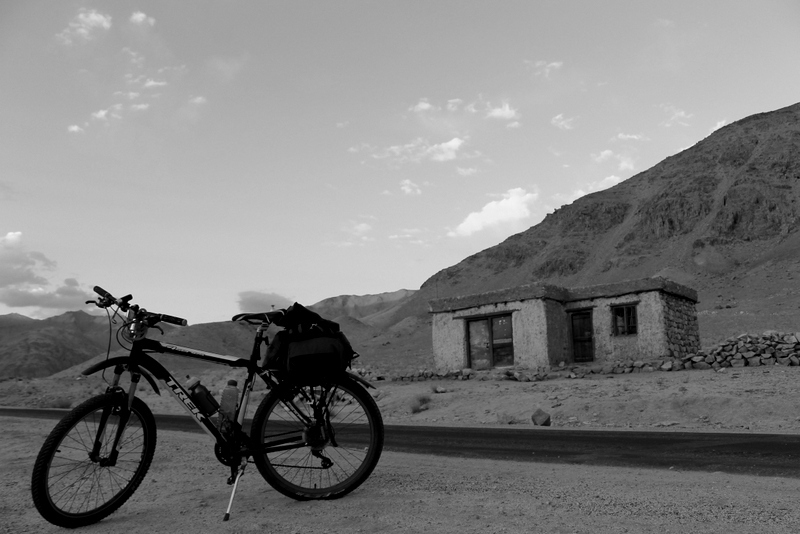 I had gone to Ladakh as part of a cycling expedition from the 4th of July to the 23rd. After getting back there were a lot of things that needed attending to and I haven’t been able to sit down and collect my thoughts about the tour. It was the biggest, most expensive, ambitious and physically demanding trip I have ever undertaken. As a result it is also the one that has had the biggest impact on me. I wish I could write it all down immediately, but I haven’t been able to even look at the photos properly till now. I thought hat I should first put down all the stuff that happened in the run up to the trip. It was in May that the mail announcing the the trip was sent out on the Bangalore Ascender’s mailing list by Rajesh PN, who along with Girish Motwani did most of of the planning for the trip. The mail caught my attention as I had been thinking of going to the Himalayas for some time. 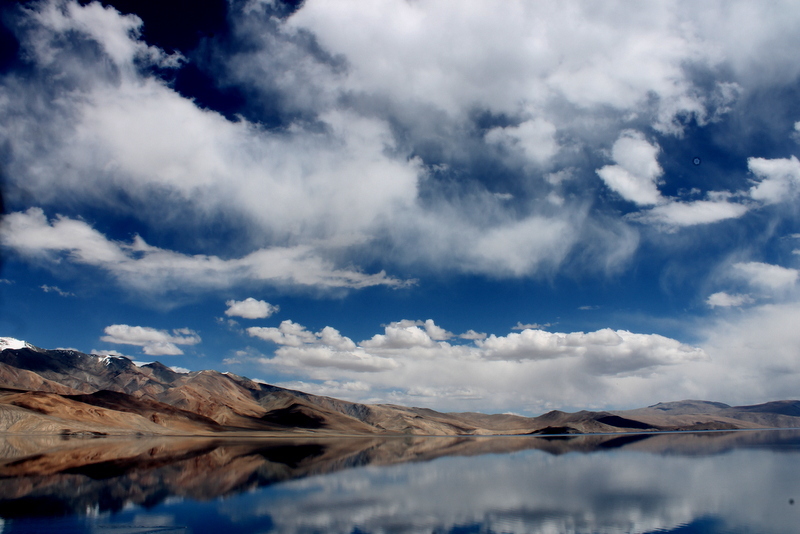 But, I didn’t have any company and I wasn’t interested in an ordinary sight seeing trip around Ladakh by vehicle. The mail seemed interesting. But, when I read the plan and saw the distance that they were planning to cover I felt a sudden pang of doubt. Can they be serious? Is it really possible to cover a 1000 kms on cycle at such high altitudes on difficult terrain? How many people are going to sign up for this crazy trip? 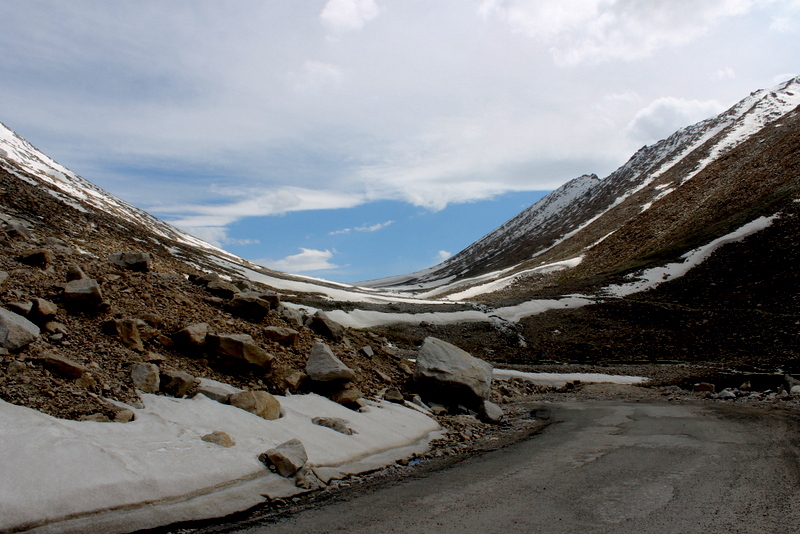 Even if I did decide to go how was I going to get my cycle to Leh? What are the risks involved in undertaking such a trip? What sort of preparation would be required for it? What if after arranging everything all the other guys pulled out? Is it really not crazy to do something like this without a support vehicle? Questions kept on popping up in my head. The more I thought about it the more the arguments against the idea piled up. I called up Rajesh to ask a couple of doubts. Before that Renjith had sent me a mail, asking me teasingly, why I hadn’t signed up for it. After thinking for a while, I decided that thinking was not much use. This was not a trip for a level-headed person. There was no brand of logic or reason which would counsel me to do it. 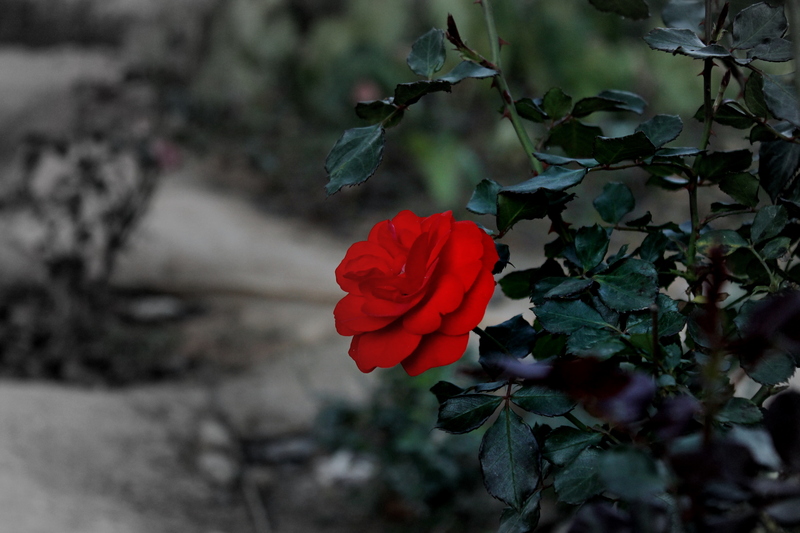 For this trip, for once, I would have to really listen to my heart. See if I wanted to do this. Once I went ahead and booked the airline tickets what would follow was difficult training and preparation culminating in a risky and testing adventure. It was an impulsive decision. I did not think about how I would do it. Just that I would do it! On the same day, I booked the tickets and called up my dad to tell him about it. Suddenly, things seemed different. Everything I did had one more purpose, one more aim. The trip loomed ahead of me like a mountain before a climber. Both foreboding and exciting. Both terrifying and tantalizing in its possibilities. Before a trip one always feels some inertia and doubt… It is like a sky-diver hesitating before making the jump. There is fear and anxiety. But, there is also the knowledge that beyond the crucial one step lies the unknown, beckoning to him… To listen to that call and step out of your comfort zone, that is what adventure is all about. On one Friday evening(in March), as I was wrapping up the day’s work, I felt a sudden urge to go somewhere. It was such a strong one that I decided that no matter what the obstacles I simply had to do it! It was past 9 by then and it would have been tough to book a bus ticket and catch the bus that same day. So, I thought that driving would be a better option. I called up a friend of mine(Sarat) and asked for his car for the weekend. He agreed to lend it to me and also decided to accompany us on the trip. Before that I had spent a few minutes thinking about where to go. 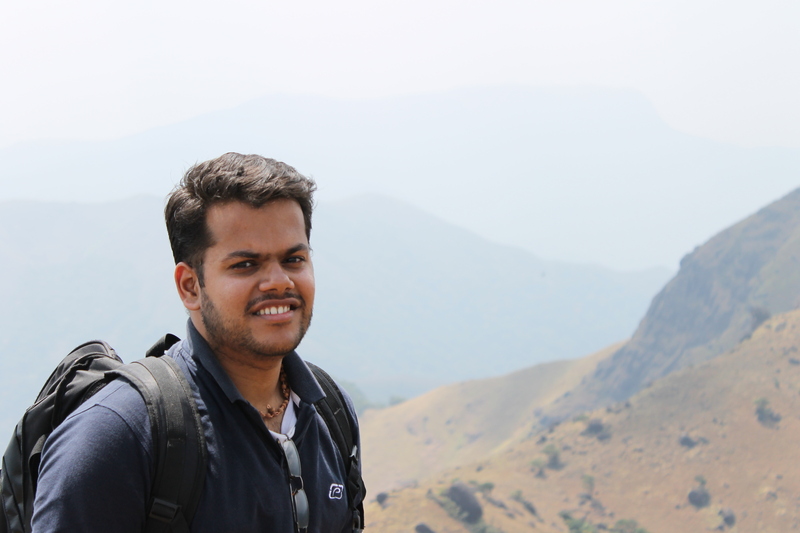 I had zeroed in on Agumbe. I had already been there once. 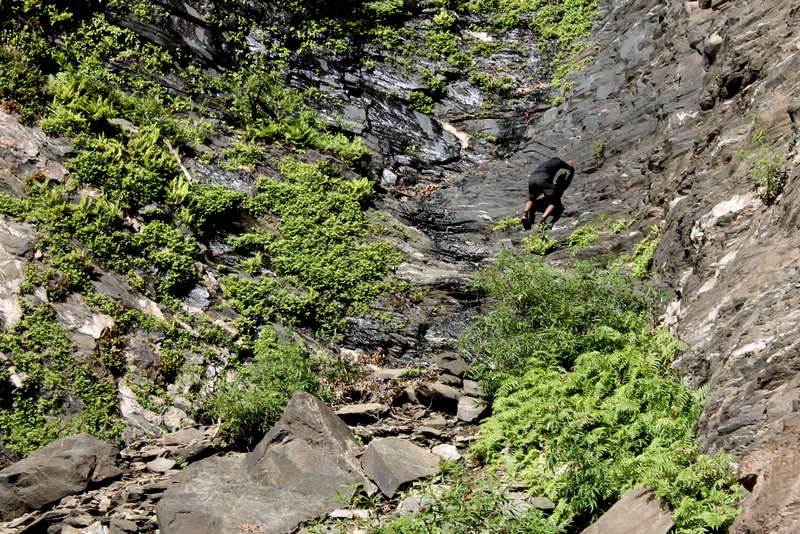 But, the last time we went there we could not do one particular trek that I badly wanted to do. After deciding on the place and mode of transportation, I called up my friends and told them about the plan asked whether they wanted to join me. Renjith and Gobind agreed to come. So, that evening after a lot of frenzied running around, we all set off for Agumbe by around 11. 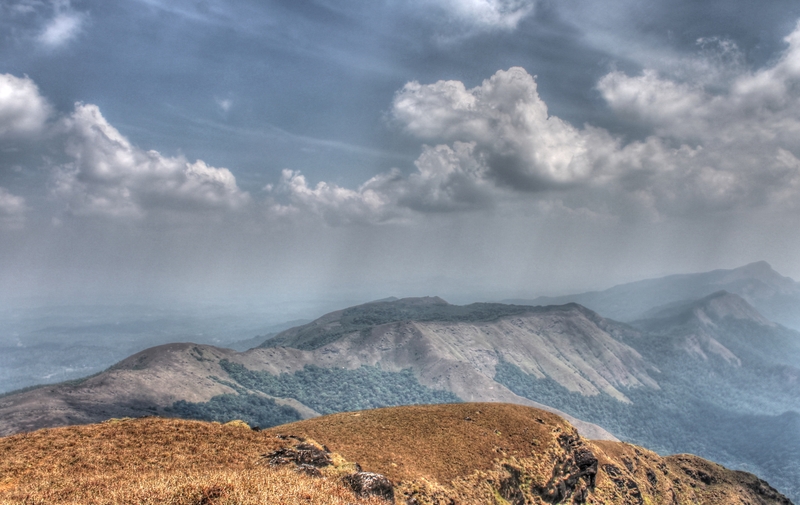 It was 380 kms to Agumbe and after an overnight drive, we arrived there by about 7 in the morning. None of us had a clue about the route and the roads were more or less deserted. So, it was google maps all the way! We made a lot of mistakes and had to travel some extra distance but we still managed to make it to Agumbe in time for breakfast. 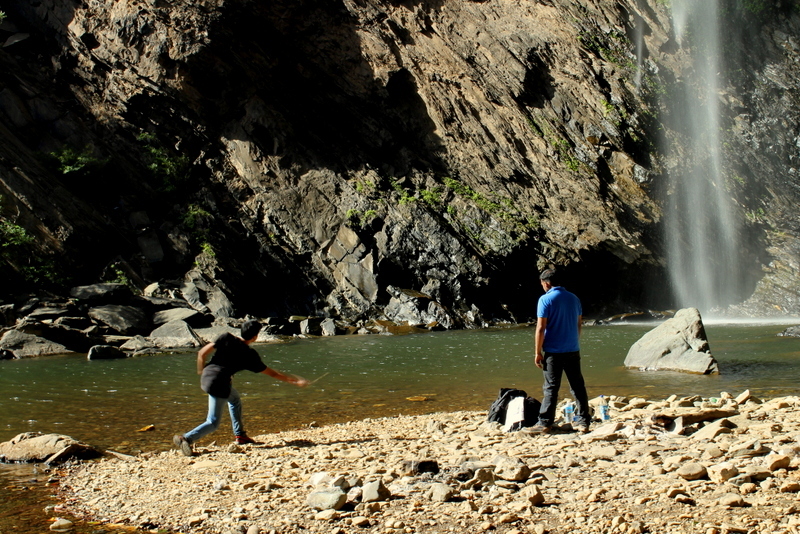 After freshening up we went to the Police Station to ask for permission to trek to Barkhana Falls. Not the view point, but the actual falls. But we were in for a bit of bad luck, well, sort of… On that particular weekend there was a naxal combing operation in progress by armed policemen and they informed us that there simply was no way we could do the trek that day, I was a little disappointed as I had seen all the other places in Agumbe and this was the main attraction as far as I was concerned. 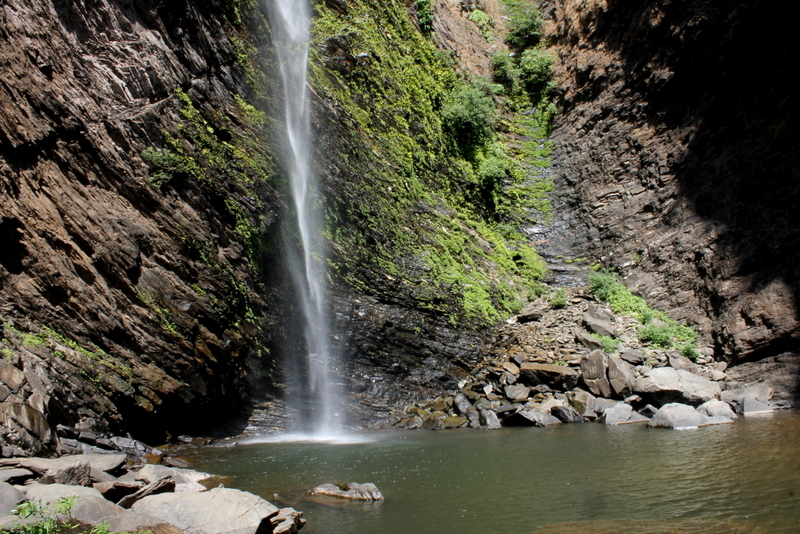 But, the policemen were real nice and after seeing our situation, they suggested that we visit the Kudlu Waterfalls near Someshwara and told us that the visit would be well worth the effort. So, we decided to take the advice and go there. It was convenient for us as we had the car with us. We packed some Avalakki from Kasturi Akka Mane and left for the place by around 12. After getting there we parked our car at the start of the trail and from there we started walking. 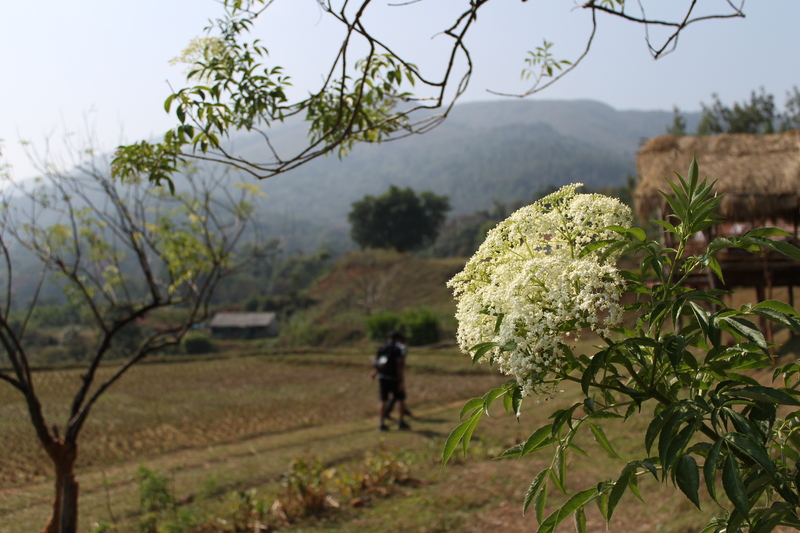 Initially, we were mostly just walking through mud roads and we could see a few villages on the way. The sun was high up and the walk was pretty tiring. 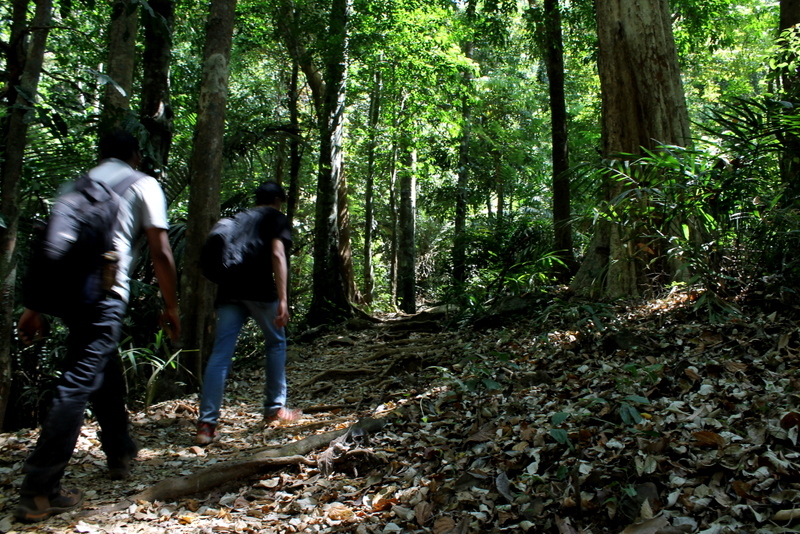 But, after around 2kms we reached tree cover. From then on, the walk was really enjoyable! 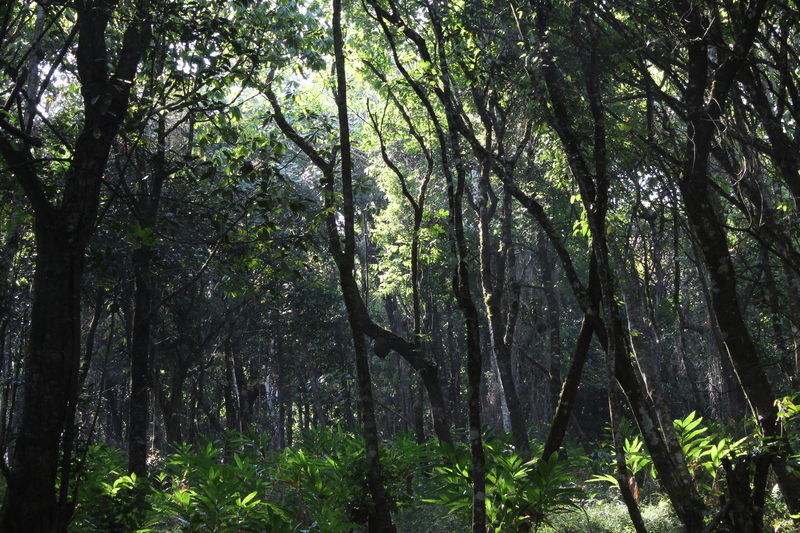 The dense vegetation gave us good shade and the air was cool and fresh. I was really weary from driving the whole night and running around for the permission. But all that weariness slowly started disappearing as we walked along the peaceful trail. 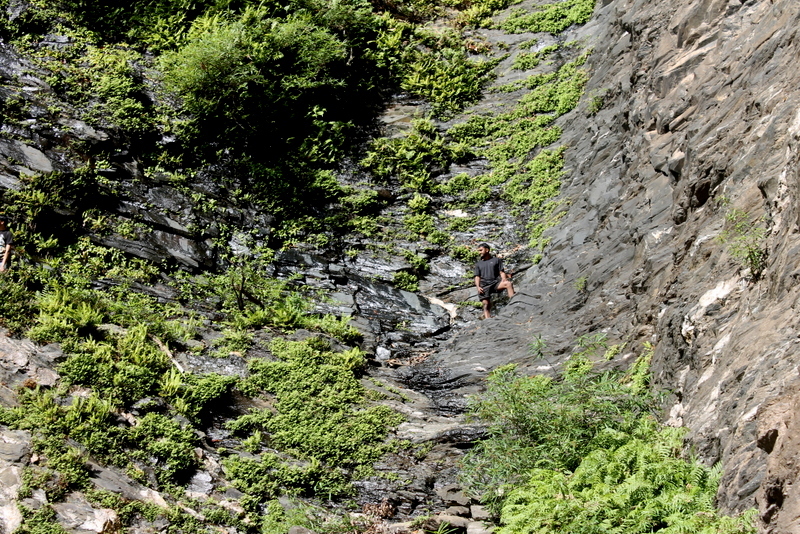 After a while, we met a guy who seemed to be collecting some forest produce who helped us find the right trail and led us up to the water falls. It was such a strange feeling when we got there. As we watched the water falling in a misty threads from the height forming a natural shower in a crystal clear pool of water, we immediately forgot the fact that we were tired and I was suddenly all excited and hyper-active. After lazing around for a while we jumped into the pool! It was a little shocking at first as the water was rather colder than we expected it to be and I spent the first few seconds helplessly hyper-ventilating. But, then I just dipped my head under the water and let the cold take over. After playing in the pool for a while, we walked around it and got to right under the waterfall. The fluctuating wind kept pushing it back and forth. So, we stood at a spot and waited for the piercing fury to strike us. Soon enough the waterfall moved to our spot and for a few minutes we were treated to a sensation that was both strange and exhilarating! The water struck us with great force everywhere and it was both painful and soothing and when it was right above us, for a few seconds, I felt a kind of absolute peace and complete isolation! Maybe this place could make a buddha given the right kind of raw material! When the sun had lost its edge, we started on our way back. That night we all had dinner at Kasturi Akka’s place and I had a kind of sleep that felt a lot like how I had imagined death to be. The next day the trek was still a no-go. Besides Gobind had some urgent work at his office. 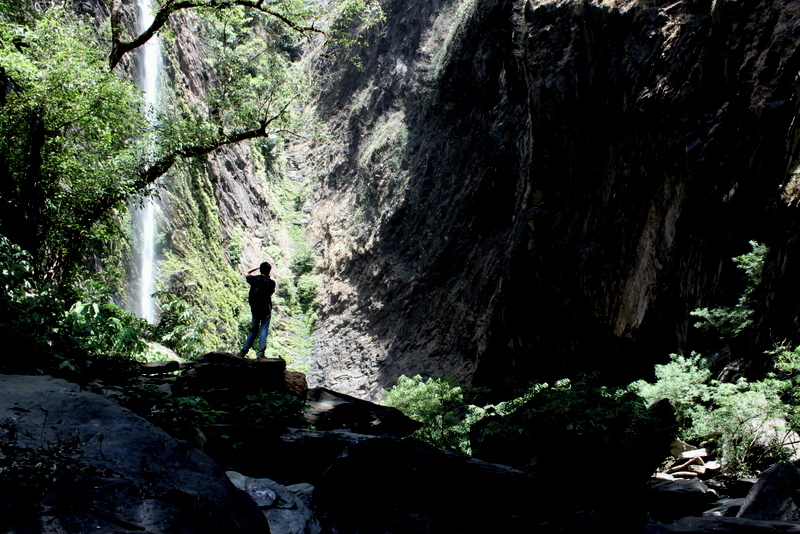 So, we decided to restrict ourselves to visiting Jogi-gundi falls which was close by and after that we set off for Bangalore. We got back by nightfall. All-in-all, a trip that went not-at-all like I had planned it. But, still an enjoyable one. Nowadays, my planning is going from bad to worse. Hope my friends had a good time! 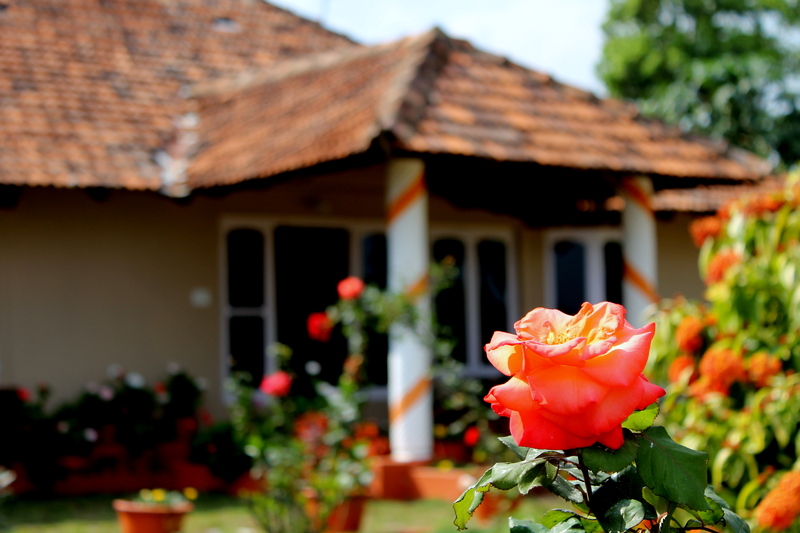 I have read a lot about Coorg(Kodagu) and it was always there on my list of places to visit. 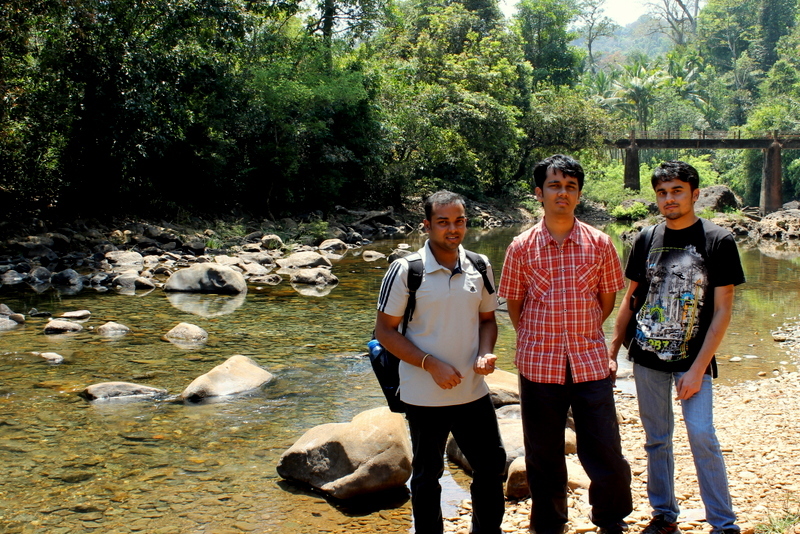 So, one weekend we(Me, Valiyettan and Nipun) decided to go there and relax for a couple of days. I did a bit of research and found a couple of home-stays. 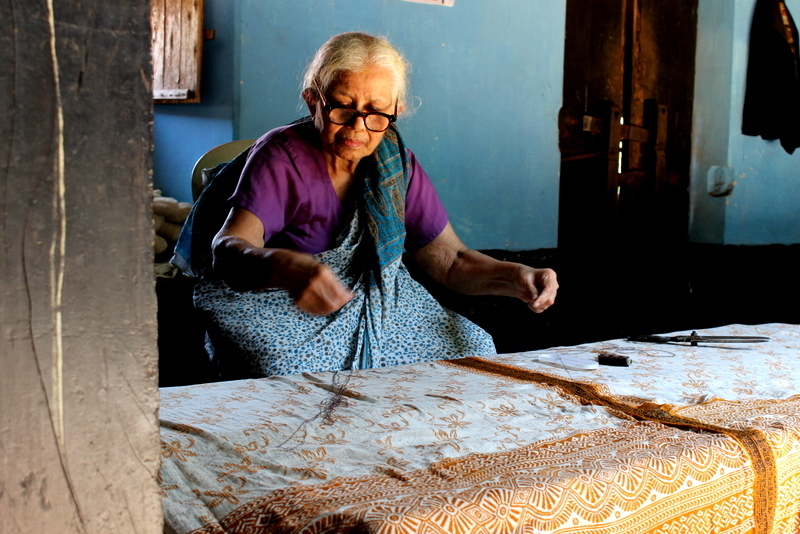 We booked ourselves a room at Reena Devaiah’s home-stay. 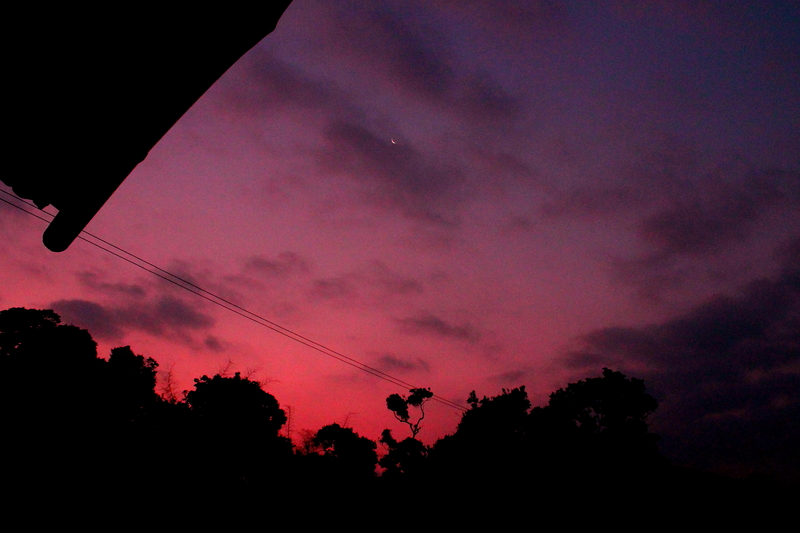 We set off for Coorg on Friday night and arrived there by about 5 in the morning. We took an auto to get to the home-stay which was around 7 kms from the town. After getting there we freshened up and after break-fast had a discussion on what to do that day. 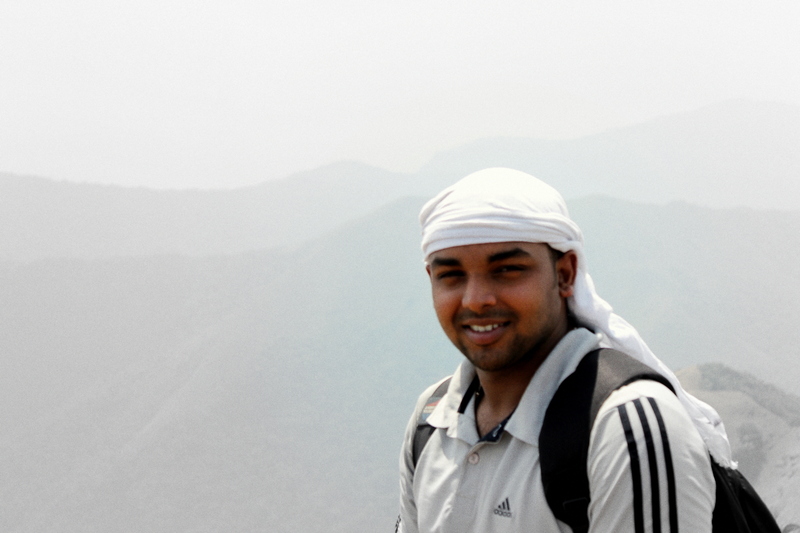 We decided to trek to Thadiyandamol. So, we set off on foot to the main road, and got ourselves a lift to town. On reaching the bus stand we saw the bus that we were supposed to take(yo Kakkabe village) was about to move out. So, we decided that we would have break-fast from somewhere on the way and jumped onto the bus. On the way they stopped at a place and I bought a few packets of biscuits and water. But, we didn’t eat anything proper. On getting to the base, we realized that there were no places to eat there. I was kind of okay. But the other two guys were throwing me sour looks once in a while as they were really hungry. We also did not have any guide with us. But, we got lucky. There was a Belgian couple(Michael and Florence) who had also come by the same bus and were going to trek to the top. They had a guide with them. So, we went and talked to them and made friends with them. So, we had some one to point us the way at least. We started on our trek. 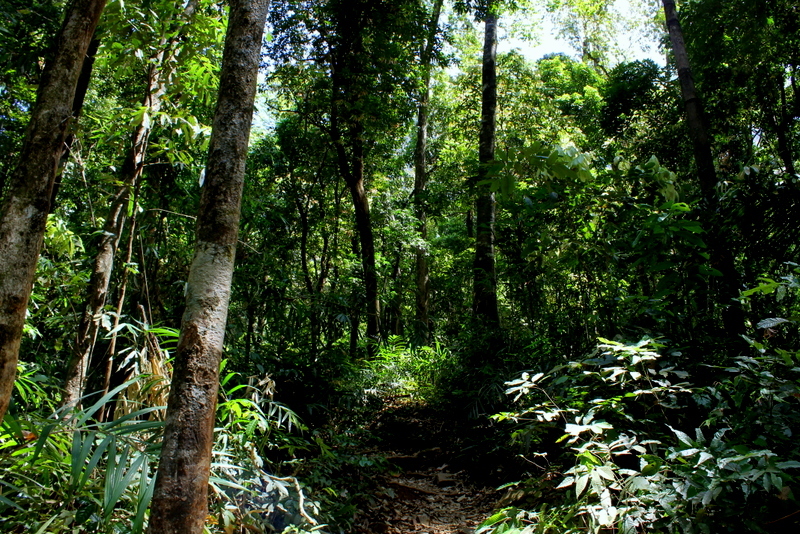 The initial part of the trail was through some coffee plantations. 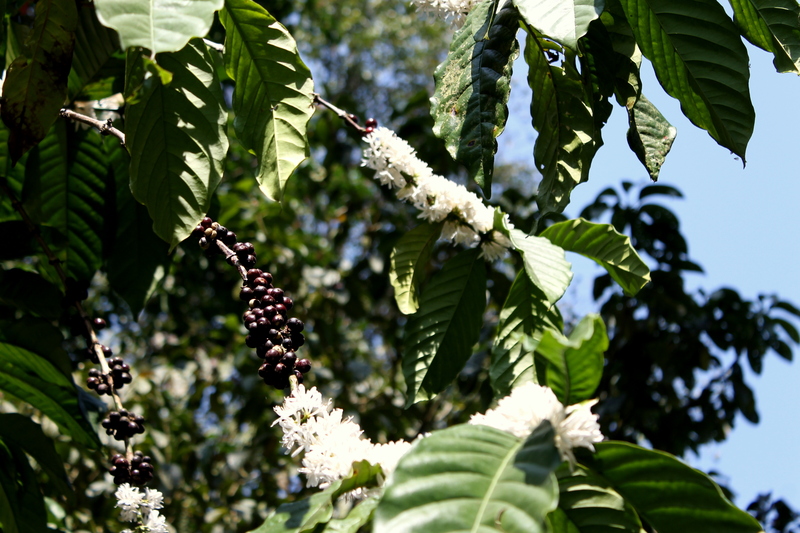 We could see the coffee trees and smell their fragrant flowers. The sun was already high up and the heat was considerable. Luckily, I had bought along a lot of electrolyte and we mixed it with the water. I was in a silent mood. But, that was completely okay as Michael and Florence were very interesting company. Veliyettan was discussing the economy of Belgium, growth prospects of the technology industry here and other such very weighty matters. Nipun too was bugging the poor woman with some such talk. I was running ahead as I wanted to spend some time and learn how to use my new camera while they caught up with me.The walk was a long one. On the way the guide made a small detour and we got to a stream where we filled our water bottles and ate some of the biscuits. After that the grade started increasing and we were gaining altitude. Very soon we started seeing more and more people. They probably had set off in the morning. We had caught up with them. The sky was clear and at every turn I could see the magnificent mountains spread out in all directions. After a while, just when I thought that the sun was too much the trail plunged into tree cover. The air was cool and the air light and refreshing. I walked like a machine and sped up like a rocket. As the peak neared and the crowd started to become thinner and thinner my enthusiasm and energy started peaking. Finally, in one surge of energy I got to the very top. I was awestruck by the breathtaking vistas spread out in all directions. Usually, whenever I go trekking, there is almost always a lot of cloud cover and I never get to see anything worthwhile.This time it was different. I just let myself fall down and lay there looking up into the sky. Just behind me a bunch of guys from BMC(Bangalore Mountaineering Club) had come up. I talked to them and spent some time discussing about previous trips and stuff with them and exchanging email ids. 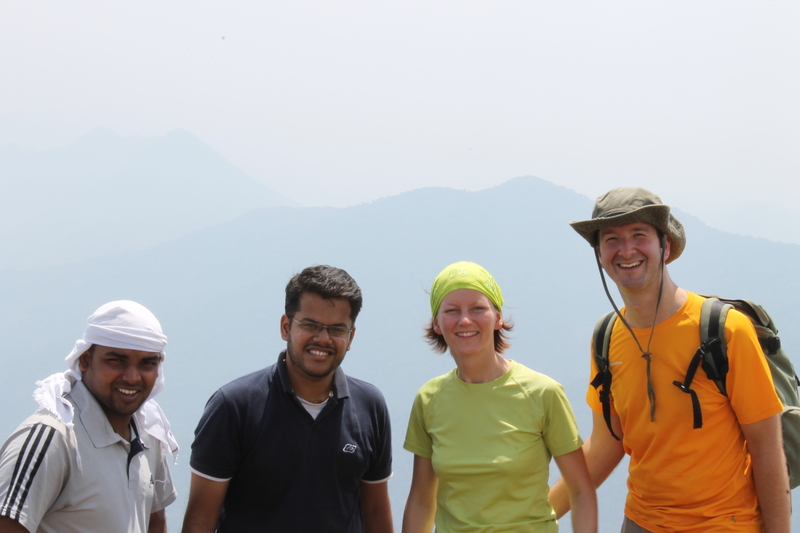 After a while Michael, Florence and their guide came up and behind them Veliyettan and Nipun. We all rested for a while. We did not have any food with us and the strain was starting to show. After some time we set off on our way down. All of us were really hungry. 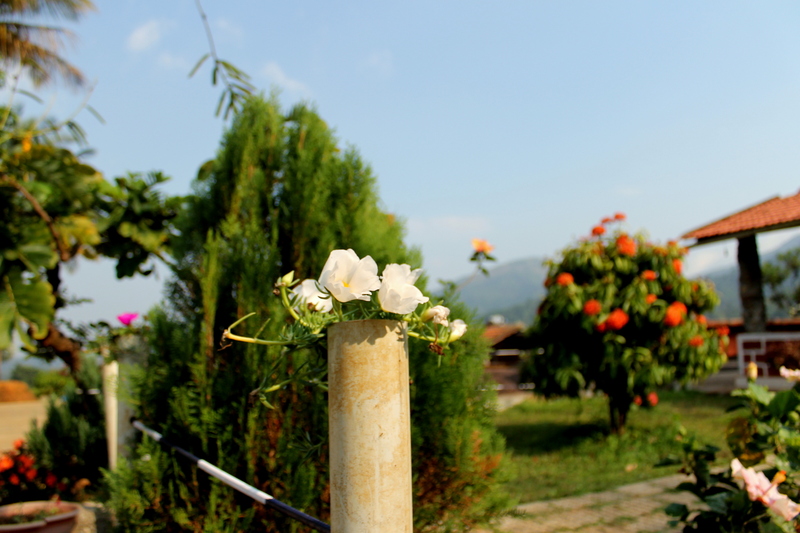 We had asked a guy at a home stay on the way to prepare lunch for us. By the time we got there we were nearly faint with hunger. 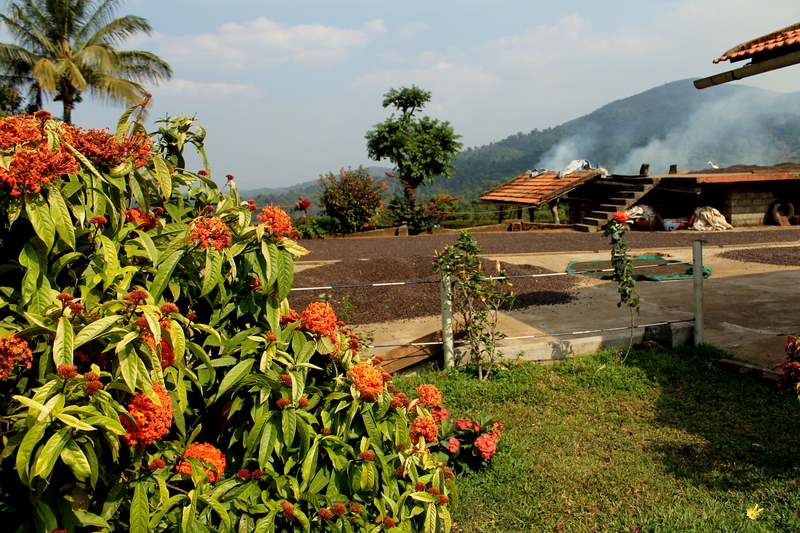 Almost every home we saw had coffee beans spread out in front! I had managed to nearly starve my friends to death. But, thankfully, the lunch was worthy of our raging hunger! There was salad, rice, sambhar, moru curry, cabbage, pulavu, mulaku bhajji, bananas and more. We dug in and in no time we had decimated all the food on the table. Satiated we lay back and asked for some coffee. I don’t know whether this is a psychological thing or for real. 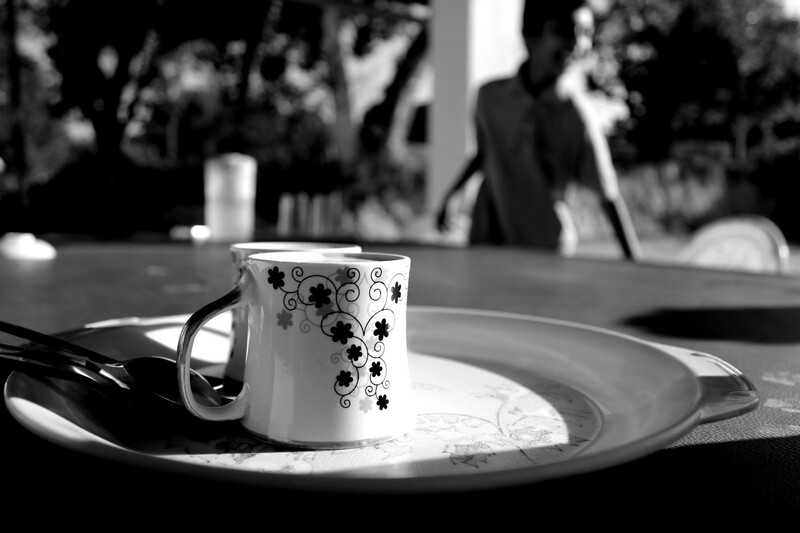 But, there is something special about Coorgi coffee. We sipped it and just lay back in the easy chairs and let our eyes roam around the pleasant garden they had. 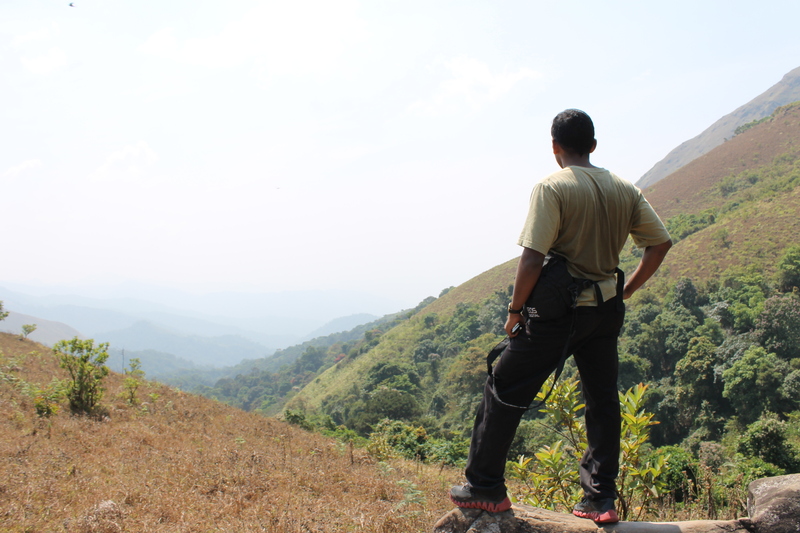 After a while, we made our way back to the road, caught a bus and got back to Coorg. We bought some “medicine” for our tired bodies and set off for the home stay. Luckily, for me, the other 2 guys were vegetarians. This meant that all that beautiful chicken prepared in the delightful Coorgi style with Pork Masala was for me alone. We ate to our heart’s fill. I, Nipun and Veliyettan had never, up until then, caught up with each other since we left college. It was a wonderful night and all of us slept fitfully after dinner. The next morning I woke up early and walked through some nearby plantation. After that I just sat back and relaxed with a cup of coffee. What happened that day is for another post! If I have OCD, does that make me a genius? This work by Sabu Paul is licensed under a Creative Commons Attribution-NonCommercial-ShareAlike 3.0 Unported License.